Affiliate Professor Michael Brauer of the University of British Columbia will give the talk “The global burden of disease from air pollution” at the American Association for the Advancement of Science’s annual meeting. In this presentation, Dr. Brauer will discuss the methods used to estimate air pollution exposure and disease burden attributable to particulate matter (PM2.5 ) air pollution for 188 countries in the context of the Global Burden of Disease 2013 (GBD 2013) and provide an overview of the approach to estimate source sector contributions. 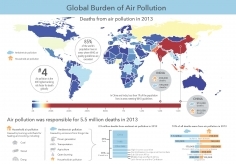 He will also summarize the most recent estimates from GBD 2013, including trends in exposure and disease burden attributable to air pollution from 1990 to 2013.